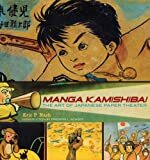 Manga Kamishibai: The Art of Japanese Paper Theater tells the story of a live precursor to manga, where storytellers would use illustrated panels combined with their narrative skills to spin dramatic yarns from folk tales to more modern fare. The art form peaked in the 1930's, and Eric P. Nash and Frederik P. Schodt bring it back to life through interviews and full-color panels of the original illustrations. The artwork is the star of the book, I haven't seen such a beautifully-reproduced manga collection since Chip Kidd's Bat-Manga!. This book is invaluable to anyone interested in the origins of manga, or of oral storytelling history. My next book is Oishinbo Volume 5: Vegetables, by Tetsu Kariya & Akira Hanasaki .